A computer desk for your home is a great piece of furniture for working at home, paying household bills and providing a specified area for computer related activities. You don't need a separate home office with these great computer desk choices; you can use a corner in your den or a small space in your kitchen, bedroom or other room when you select one of these desks. 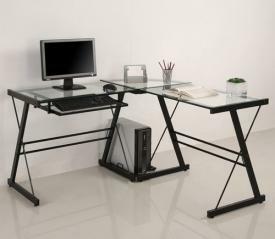 Computer desks are available from a wide range of websites and local furniture and office stores. You can use either a tower computer system or a laptop with any of these desks. 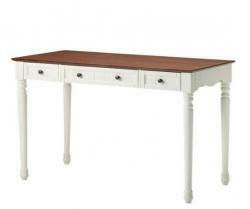 This is a cottage style desk with a stained oak finished top and ivory painted body and spindle legs. The center drawer pulls out to hold a keyboard. Cramped for space? Try this corner tower style desk. 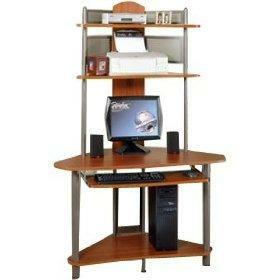 This is a wood grain laminate desk top with engineered wood side panels and mobile CPU caddy. This L-shape desk with glass top on metal frame desk fits snuggly into the corner. Black or silver frame with clear glass. Black frame also available with black glass. This simplistic desk design can be combined with other desk and drawer units. Short on space? This computer tower desk is ideal for limited space. Silver satin metal and tempered glass top and shelf are just a few of the nice features. Legs and base made from solid wood in espresso stain finish add to the look. Need a little more storage in your desk? This one gives you a lot of bang for your buck with plenty of valuable features. A great space saver with a sleek metro look! This corner desk is made from hardwood veneers and painted black. This desk features stylish design for the storage-challenged home. This wood composite construction is available in white or black painted finish desk styles. 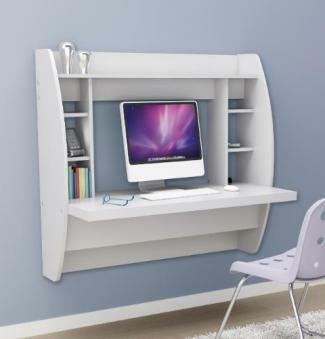 Ultra-stable space saver desk is mounted on the wall at any height desired. This desk is also an elegant piece of furniture for your room. Hide your workspace with this classic secretary desk design. 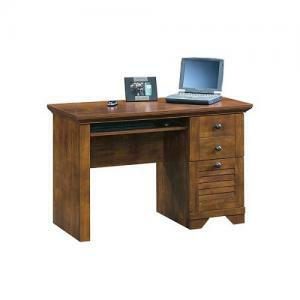 Made from solid mahogany, the desk offers lots of space for great organizing of electronics and paperwork. There are many things you want to consider when browsing for your ideal computer desk. Storage space is always a premium, however, it adds to the overall cost of a desk. There are many options available for office storage. You need to consider the space you have available for the desk. If it's a corner in a den or a small area in a closet, alcove or other room, pay attention to the desk configuration and actual size. Finally, you want to make sure whatever desk you purchase will blend with your existing décor and other pieces of furniture. A computer desk is typically smaller than an average office desk. Many times you must compromise on the amount of storage space the computer desk offers. You may need to use other pieces of storage units placed underneath the desk, so make sure you have enough leg room should you opt for this additional file cabinet or cart for a tower or printer. You also need space for daily essentials such as paper, pens and pencils, paper clips, a stapler and all the other office supplies that go along with a home office. Some desks have additional storage options with hutches or shelving. Make a list of office accessories you need to accommodate to help you decide on the features you need in your computer desk. Computer desks come in a few different shapes including corner, L-shape and U-shape. These can be great because they make the most out of awkward corner areas, but make sure that your room will accommodate the desk dimensions. Measure your desk space so there won't be any surprises when you come home with your find. Computer desks are available in many different styles so make sure to get one that will go with your exiting furniture and décor. Style is as important as function. For example, if your home is a modern design style, opt for a modern desk or a style that will complement the interior design style. Choosing your computer desk should be a fun and easy process once you have considered the type of features needed to best serve your work. Be sure to find a comfortable chair that can be adjusted for height and back tension. Many computer desks come with matching pieces of office furniture that you may want to add over time to build-up your home office space.